Metro announced a new fire and rescue liaison Monday. Hatchet File Photo. Metro has added a fire and rescue liaison to watch over its control center, transportation officials announced Monday. The uniformed firefighter will work 40 hours a week at the Rail Operations Control Center to “help coordinate emergency communication between Metro and first responders,” according to a Metro press release. “”The new fire/rescue liaison at the Rail Operations Control Center gives first responders ‘eyes and ears’ on Metrorail operations and will serve to further strengthen the coordination between our operations staff and emergency personnel,” Metro Transit Police Chief Ron Pavlik said in the release. Prince George’s County Fire Chief Marc Bashoor said in the release that in the first few days, the liaison helped support more than two dozen incidents. The person hired to the position will also provide policy recommendations and give extra training to rail controllers, according to the release. 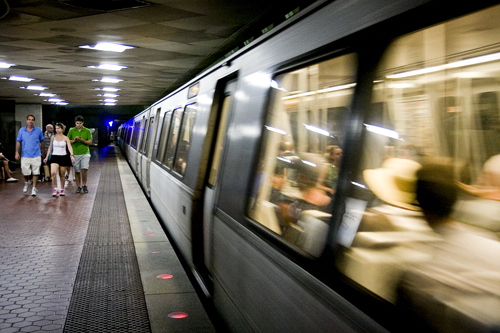 In February, Jack Evans, who represents Ward 2 for the D.C. Council, said he fully supported building a second entrance for the Foggy Bottom Metro station, a move community members said would improve passenger safety at one of the busiest Metro stations in the District.